Guinness Original Bottle is a popular Stout available from Tesco Groceries in 50cl to buy online. Visit Tesco Groceries for the best price for 50cl of Guinness Original Bottle or compare prices on our other Stout products. Guiness Stout is the original Guinness created in the early 17th Century in Dublin. The beer is the forerunner of the famous Guinness Draught. With a robust taste and deep copper colour the stout has bready overtones from the malt process. This is a drink similar to 'craft' beers and is enjoying a resurgence amongst drinkers. 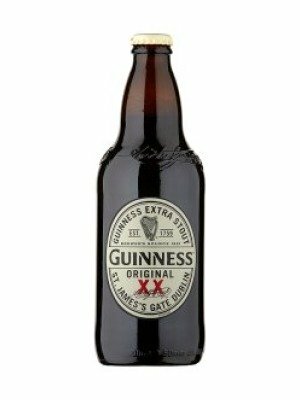 Where to buy Guinness Original Bottle ? Guinness Original Bottle Supermarkets & Stockists. You can buy Guinness Original Bottle online in most retailers and find it in the Stout aisle in supermarkets but we found the best deals online for Guinness Original Bottle in Tesco Groceries, Amazon.co.uk, DrinkSupermarket.com, and others. Compare the current price of Guinness Original Bottle in 50cl size in the table of offers below. Simply click on the button to order Guinness Original Bottle online now.